A tiny behavioral-sciences startup is trying to improve the way federal agencies do their work. Considering the size (and habits) of most federal agencies, this isn’t so simple. But after a series of early victories — and a helpful executive order from President Obama — they are well on their way. Hey, this is Stephen Dubner. We’ve got a brand-new episode coming up. It’s about a behavioral-sciences startup in the White House. I think you’ll like it. But first I want to tell you about something else you might like. It’s a whole new podcast I’m starting, called Tell Me Something I Don’t Know. You may remember hearing a pilot episode we did, here on Freakonomics Radio, a while back. But now it’s its own thing, a permanent addition. You can go to iTunes right now, or wherever you subscribe to podcasts, and sign up – it’s free, of course. Here’s a very quick preview of what you’ll be getting. The Freakonomics mission has always been pretty simple – to tell you things you always thought you knew, but didn’t; and things you never thought you wanted to know about, but do. And now we’ve come up with a whole new way of doing just that, with this new podcast, called Tell Me Something I Don’t Know. It’s still journalism, still factual, but it’s also a game show where contestants from the live audience try to — well, they try to tell us something we don’t know. Every night there’s a new theme and three celebrity panelists to help us sort out what’s worth knowing and what’s not. You’ll hear from comedians like Hannibal Buress, Keisha Zollar, and Chris Gethard. You’ll hear from professional smart people like Barnard College president Deb Spar, New York Public Library president Tony Marx, and non-fiction author Simon Winchester. You’ll hear from Gretchen Rubin, Austan Goolsbee, Annie Duke, Sam Kass, Dr. Oz, Andy Zaltzman, and more – all working their very hardest in the service of learning valuable new information. The first episode of Tell Me Something I Don’t Know drops on November 7th. Go subscribe right now on iTunes or wherever you get your podcasts. And if you want to be a contestant on Tell Me Something I Don’t Know, or get tickets to a live taping, visit TMSIDK.com. Also, follow TMSIDK on Twitter, Facebook and Instagram. Just to be clear: this new show is not replacing Freakonomics Radio; this sucker isn’t going anywhere. All right now, on to this week’s episode of Freakonomics Radio. Fort Bragg is a massive Army base in North Carolina, home to more than 45,000 active-duty personnel alone — and then there are reserves, civilians, contractors, family members, and Army retirees. How much money does an Army retiree have to live on? Well, it depends when they started saving. Consider a relatively new Army recruit, Private Thurman Dixon. He’s still a teenager, just signed a six-year contract out of high school. He’s only paid $700 every two weeks, but the Army covers the basics: housing, uniforms, cafeteria food, healthcare, and so on. Which means Dixon can spend most of his paycheck on whatever he wants. Thurman DIXON: Shoes, clothes, video games, out to eat. I mean what else do I need to spend money on? I don’t really have any necessities or any things that I have to pay for. So a lot of it is just having fun. It’s a lot more fun than, say, peeling off 10 or 15 percent of each paycheck and putting it in a savings or retirement account. DIXON: I’m a terrible saver. So when I get paid I feel like I can just blow through the money and that, “Oh, I’ll get paid again in two weeks, so it’s really nothing.” But maybe that’s the problem. Maybe we just spend too fast and too much. We don’t really think about saving. Maya SHANKAR: Yeah, but I think actually the greatest reason for this difference is that civilian employees are automatically enrolled in these plans, but military service members have not been. That’s Maya Shankar. She’s a White House policy advisor – and then some. She’s the star of today’s episode; we’ll hear more from her in a bit. Shankar’s point about participation rates in the government savings plan is really basic: some federal employees are automatically signed up and others, like military personnel, aren’t. What would happen if they were? And how would that happen? Well, when we spoke to Private Dixon, he’d just transferred to Fort Bragg from the base where he trained. VIDEO: TSP is like a 401k. It’s an investment program in which hundreds of thousands of service members participate. And then, they were required to make a yes or no decision on enrollment. ANTUENET JONES: Soldiers are actually afforded the opportunity to make a choice, an active choice. That is Antuenet Jones, who runs the Personnel Services Branch at Fort Bragg. JONES: No trickery involved. We have no influence over their choice whatsoever. We just pretty much provide them with the opportunity and the information to make a choice. This pilot program ran for five weeks. What happened? What did the data show? You’ll learn that, and much more, right after the break. SHANKAR: Which would, if scaled up, help the service members and their families who undertake over 640,000 transfers to new military bases every year. 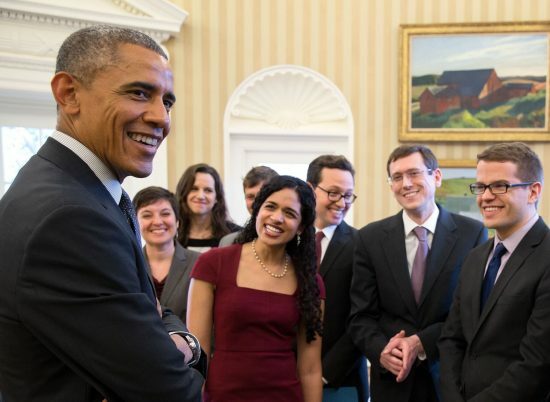 Maya Shankar is a senior policy advisor at the White House Office of Science and Technology Policy. She’s also the founder of a little-known governmental unit that helped set up the Fort Bragg pilot. Her unit is known as the SBST, for Social and Behavioral Sciences Team. SHANKAR: Which is a group of applied behavioral scientists that works across the federal government to translate insights about human behavior and how we make decisions and how we act on them into improvements in public policy. SHANKAR: Yeah, so we’re doing everything from helping low-income students go to college and helping student-loan borrowers get back on track with their repayments. We are trying to help the reentry population find work and support when they leave prison, helping families in Flint stay safe in the face of the lead in water crisis that’s going on. We’re also working to help farmers get access to small-business loans, and to make sure that low-income students have access to school lunches at school. This isn’t what Shankar planned on doing with her life. She planned on being a concert violinist. SHANKAR: Yeah, so I started playing violin at the age of six . DUBNER: And you grew up where, Maya? SHANKAR: I grew up in Cheshire, Connecticut. So, my dad is a physics professor and my mom helps international students get green cards and visas to study in the United States. At age nine, she auditioned for the Juilliard School of Music in New York, and was accepted. But at 16, Shankar suffered what turned out to be a serious hand injury, a tendon tear. SHANKAR: I was playing a Paganini caprice, number 13. DUBNER: Oh, that’s not such an easy piece, is it? SHANKAR: It was very challenging. Probably exceeded my technical prowess, which is why I got into trouble. DUBNER: How despondent were you when you realized that this dream was done? SHANKAR: I was really quite devastated because I was so deeply involved in the musical world. And when you lose something like that, your goal is to basically start putting the pieces back together. And I was very worried that I would never find anything that I loved more than I loved music. The summer before college, Shankar was helping her parents clean out their basement. SHANKAR: And I ran into an old course book of my sister’s that was called The Language Instinct by Steven Pinker and I remember reading just the first ten or fifteen pages, and I was immediately gripped. In that moment, I just wanted to understand everything there was to understand about how our brains were wired and how we learn and the interaction between nature and nurture . SHANKAR: … who told me the story of the national school lunch program, which offers low-income students free and reduced-price meals at school. And I remember hearing that unfortunately many, many kids who are eligible for free meals at school were actually going hungry every single day because of a burdensome application process. And this was really remarkable to me, right? You don’t think about barriers like application processes as actually deterring kids from being enrolled in programs. But I was excited to hear that the U.S. Department of Agriculture took steps to eliminate the need for an application altogether for those students whose eligibility could be determined through existing administrative data. And since the policy change, over 12 million kids had been automatically enrolled into free meals. So I heard this story. It had huge emotional resonance for me. I saw firsthand an example of the behavioral insight of automatic enrollment being applied to a pressing policy challenge. And it was a light-bulb moment for me. I realized that this was the sort of work that I wanted to be doing in my career. But I also realized that there was tremendous potential to more systematically apply these insights to public policy. And that without a coordinated effort, there was no guarantee that, you know, the latest behavioral science would actually find its way into government. You know, we really needed a pipeline. Shankar’s vision was a dedicated team, within government, that could range across departments and help test out and apply behavioral insights. Which sounds like a good idea, right? But Shankar was only in her mid-20s, and had spent most of her adult life in academia. She sent an e-mail, out of the blue, to the White House’s deputy director for policy in the Office of Science and Technology Policy. In 2013, she got a job as a senior policy advisor. By 2014, the SBST was up and running. DUBNER: How did that happen? Did the President just hand you a bunch of money and an office full of staff and say “go for it, Maya!”? SHANKAR: Absolutely not. That’s not how it happened. How it did happen was that Shankar built a team bit by bit and then persuaded federal agencies, one by one, to let her team collaborate with them. SHANKAR: I had to inspire organic interest and allow them to see the inherent value of what it was I was proposing. There was no high-level mandate that I could point to and there was no budget I had to help execute on this goal. If this idea sounds familiar – embedding a behavioral-science team within a federal government – you may have heard about about a similar project in the U.K.
David HALPERN: Hi, I’m David Halpern, I’m the head of the U.K.’s Behavioural Insight Team, often known as the Nudge Unit. We’ll be hearing from Halpern at length in next week’s episode, about a particularly interesting project the Nudge Unit is working on. But, long story short: a lot of the work that Halpern’s team has done in the U.K., and elsewhere, is the kind of stuff that Maya Shankar wanted to do with her team in the U.S. They began with some pilot projects — with the Department of Education, the Department of Veterans Affairs, Health and Human Services. They earned a few early wins with simple behavioral nudges. Increasing college enrollment among low-income students, for instance, by texting reminders to complete certain tasks, like applying for financial aid. They had a similar success with ObamaCare applicants. In 2015, President Obama himself issued an executive order – called “Using Behavioral Science Insights to Better Serve the American People” – and that made SBST substantially more legit. DUBNER: How big is the SBST staff now? SHANKAR: We have roughly 35 people. DUBNER: Okay. And are most of them researchers who actually work for the unit, or are there many researchers that are academics affiliated elsewhere? SHANKAR: Well, I built the team as a cross-agency effort so that it’s part expert behavioral scientists and also part expert policy and program makers. Because no matter how much expertise you have in behavioral science, if you’re not intimately working with program staff who understand the nuances of program implementation and are working with the populations those programs serve day in and day out, you’re really going to be missing a huge part of the puzzle. So we have around 20 dedicated behavioral scientists, and then representation in roughly 20 agencies across the federal government. DUBNER: And how does the White House view the ROI on SBST? Is it seen as something that should be hugely revenue-positive because it’s theoretically, you know, improving and streamlining so many processes? SHANKAR: Yeah, I think that’s right. I mean in every instance, we are leveraging existing program funds to run these sorts of projects, so we don’t have an independent budget to actually run programs. And in all cases, we’re just trying to make the programs work more effectively and more efficiently, which means you’re getting more bang for your buck in terms of taxpayer dollars. And so what we’ll do in those cases is we’ll start most conversations with our federal agency partners with the question: “So what are the problems you’re already trying to solve? What are the goals you’ve already articulated for yourselves?” And then we look to the research literature in behavioral science to try to identify all of the tools and behavioral techniques that we might have at our disposal to help our agency partners achieve those goals more effectively and efficiently. For instance: the Bureau of Prisons had developed a re-entry handbook to help the 40,000 people who are released every year from Federal prisons. SHANKAR: And SBST was brought in to help on the development of the handbook and to make sure that behavioral insights were integrated into its content. And we proposed a number of different changes, but among them were developing checklists that featured action steps inmates and former inmates could take before release. And then, longer term. And the reason why it was so important to distill all of the recommendations into these time sequenced checklists is that in many cases, the proper sequencing of actions is very important for preventing setbacks. So for example, encouraging individuals to obtain a birth certificate prior to release can then accelerate their getting a government-issued photo ID upon release and applying for work. We also addressed individuals as community members versus ex-convicts because we know from social psychology that people are far more likely to act in ways that are consistent with the identity that they associate with. DUBNER: Let me just push back on one element of that. So when you talk about the handbook for released prisoners having checklists and action steps … You know, it makes me think about one potential failure of so much government policy, which is that the kind of people who typically design policy have a totally different set of behaviors than the people who the policy is meant to serve. In other words, people like you, Maya Shankar, follow instructions, you’re a cooperator, you exercise a lot of self-control and self-discipline in your personal and professional lives. Someone who is just getting out of federal prison, almost by definition, didn’t do most of those things. And so I’m curious how you try to create or influence policy for populations that would respond to incentives or cues very differently than you, the people sitting in the White House or elsewhere. SHANKAR: Well I think I’ll push back on your point, which is I think they may have had an instance in which they didn’t follow the rules or didn’t demonstrate self-control. But that doesn’t necessarily inform their day-to-day behaviors or the way that they’ve acted subsequently or even prior to the crime they committed. In fact, the individuals that I’ve spoken with who have left prison are highly motivated. They want to be compliant. They want to get themselves back on a path to success, and are really eager to take proactive steps. So I think it’s wrong for us to falsely generalize from an isolated instance something deeper about that person’s psychology and the way that they act. And so I think that’s the first answer to your question. I think the second is that part of the design process was actually bringing in a formerly incarcerated individual, in this case a Second Chance Fellow, to weigh in on the design of the guidebook. To make sure that we were talking about mental health in appropriate ways. To make sure that we were framing resources in ways that would resonate with this population. And so, again that’s part of the behavioral-design process is making sure that real people who’ve actually gone through these experiences and the challenges associated with re-entry have a say in the content that goes into a guide like this. SHANKAR: So, there’s the income-based repayment plan. There is income-contingent plans. There’s the pay-as-you-earn plan, there’s the revised pay-as-you-earn plan, and there’s income-sensitive plans. Also: does Army private Thurman Dixon commit to the retirement-savings plan? DIXON: So, that may be a big problem for me. And remember: if you like your factual material served up with a side of game show, go subscribe right now to my new podcast, Tell Me Something I Don’t Know. Maya Shankar is a 30-year-old cognitive scientist by training who now runs the White House’s Social and Behavioral Sciences Team. SHANKAR: We call ourselves SBST. DUBNER: You don’t call yourselves the S-Team, The Brain Unit? SHANKAR: But if you have ideas for a snazzier name, we’re definitely open. DUBNER: You know what? Why don’t we put out the call to listeners, to Freakonomics Radio listeners, you can tweet us and Maya — what’s your Twitter handle, is it @SBST? DUBNER: That’s a problem right there. You’re going to have to remember that. SHANKAR: You’re absolutely right. I would say it’s akin to having a behavioral Band-Aid. So you don’t want to put a behavioral Band-Aid on a broken program to make it marginally more effective. Instead you want to come in at the outset to define the fundamental features of the program so that you don’t need the Band-Aid at all down the line. So by way of illustration, let’s take the design of student-loan repayment plans. So to help students better manage their debt, the Department of Education offers what are called income-driven repayment plans. And this helps student-loan borrowers manage their debt. Because it limits their monthly payments to a percentage of their monthly incomes. But within this plan category, there are many, many options that are slightly different and this can lead to a fairly complicated choice set. So, there’s the income-based repayment plan. There is income-contingent plans. There’s the pay-as-you-earn plan. There’s the revised pay-as-you-earn plan, and there’s income-sensitive plans. DUBNER: All right, I quit, I don’t want any plan. SHANKAR: Yeah! I mean don’t give me the pop quiz, I’m going to fail it, right? And I work in government. So here’s the thing, right? If you involve behavioral scientists in the process after you’ve developed all the plans and they’re set in stone, the behavioral scientists might be able to help design messages to students about these plans that utilize behavioral strategies. So they are maybe delivered from an effective messenger, they use social norms, they present decisions in terms of losses versus gains. And you might expect to see some improvements at the margins, right? Maybe a two- or three-percentage point increase. By contrast, if you bring in behavioral scientists at the outset , they might mention research showing that offering individuals more choices isn’t actually more beneficial. In fact, research shows that complex choices can deter people from participating in programs and making choices altogether. And so in this case, the behavioral scientists might recommend that you actually just consolidate all of these plans into a single income-driven repayment plan in order to simplify the choice and promote participation. And this was the sort of proposal articulated in our FY ‘17 budget. DUBNER: So you sound like you’re far too kind and politic a person to say so, but it must be frustrating to look at the policies that your unit is trying to help refine or optimize or streamline and you just say that, “Wow, these are not really occasional bugs that we’re looking at. These are features of these programs, that they make it really hard for people to do what they’re designed to do.” To what degree are you willing to admit that that is frustrating? SHANKAR: Well, I think progress is incremental. If you don’t see progress as incremental, it’s going to be hard to keep morale high within the federal government. But I think that we’ve seen the evolution happen firsthand within the federal government, which is that if you start small, and you celebrate small wins, eventually you will have built the trust and the credibility to actually engage in more powerful and more ambitious behavioral projects. An example of this incremental approach? The SBST’s work with the Department of Defense that we heard about earlier. Trying to get people like Private Thurman Dixon at Fort Bragg enrolled in TSP, the government’s Thrift Savings Plan. DIXON: I’m a terrible saver. When Shankar first met with the Department of Defense, she wondered: why not just automatically enroll military personnel in TSP? DUBNER: Which private firms have been doing for 10, 20 years now. SHANKAR: Absolutely. I mean President Bush signed into law the Pension Protection Act, which facilitated automatic enrollment, in 2006. So from a behavioral perspective, automatic enrollment is the ideal proposal. But, as you can imagine, proposing a substantial change in retirement policy that is going to affect over a million employees every year is a pretty hard sell on day one. So we began with a lighter-touch pilot in which we sent emails to 800,000 service members that prompted them to enroll. This was in 2015. Shankar and her SBST team came up with an experimental plan: sending out eight different e-mails, each using a variant of a behavioral nudge or two, to see what led to the greatest uptake. Some e-mails emphasized exactly how to enroll; some emphasized the financial upside of enrolling. The level of personalization varied as well. SHANKAR: And we found from that pilot that our most effective message doubled enrollment rates. DUBNER: And what was the most effective message? SHANKAR: Yeah, the most effective message was one that was personalized and that highlighted that even small investments today can lead to very large gains in the longer term. SHANKAR: But you have to submit the form in order to complete the orientation process, and that’s the key feature. Roughly 12,000 people transfer into Fort Bragg in a given year. This year, one of them was Major Christian Martinez. He’s been in the military for 22 years, and he’s known about TSP for a long time. CHRISTIAN MARTINEZ: My dad worked for the postal service and he had TSP. So I’d heard about it before. Martinez watched the informational video. Then he was handed the TSP form that required a yes/no choice. After 22 years, he finally said yes. The nudge worked for Major Martinez. But how about Private Dixon? DIXON: Definitely not today. Definitely not today. I think the reason I don’t do it is because I can’t touch it. So say I put something aside and then I spend all my money and I want to go touch it, I can’t. So that may be a big problem for me and to why I haven’t started it yet. But soon it should definitely be on the top of my list to get it done soon. One paradox of retirement savings is that the younger you are when you start saving, the better off you’ll be. Compounding gains and dividends really are something close to a miracle. But: when you’re young, your salary is at its lowest, which can make diverting even a little bit to retirement feel like a stretch. An Army private like Thurman Dixon, remember, is only paid $700 every two weeks. So I wanted to ask Maya Shankar if the barrier that he said was keeping him from signing up – that he couldn’t touch the money – was really the primary barrier. DUBNER: So, I’m guessing that there are a lot of military members on the very low end of the income scale who just feel like, “There’s not enough money to put away, and that you may be nicely offering me this Thrift Savings Plan, but it doesn’t really provide me that much. So how do you think I can afford to do that if I’m just trying to pay my bills?” I mean, sometimes a clever policy solution will actually highlight a different kind of problem than you were planning to encounter. Is one of the problems that military personnel are often paid very very little? SHANKAR: Well, our work is focused on lifting barriers to access or engagement for individuals who want to sign up for a program or take a specific action but aren’t doing so, because they don’t have access to clear information about the program, or are deterred by a complex application process. So sending an email reminder about enrolling in a retirement savings plan is going to make the difference for someone who wanted to enroll but just needed a reminder to do so. It’s not going to make the difference for someone who didn’t want to enroll because, for example, they were, you know trying to make a down payment on a home or didn’t actually have the resources to save. Still, the SBST’s interventions with military retirement funding have been so successful that the Department of Defense is embracing the solution that Shankar hoped for from the very beginning. SHANKAR: We’re advising on a new policy change that’s going to automatically enroll military service members into retirement savings plans starting in 2018. I mean, it’s just been a remarkable collaboration. SHANKAR: So I think it’s important to first point out that, as you know — you’re obviously deeply ensconced in the behavioral-science world — there’s no default-less state in the world. So regardless of whether SBST is involved, every program has a default design. If you go to a restaurant, menu options are listed in a particular order, and we know from research that people are more likely to pick the first option that they see from a set of options. And quite frankly if you’re a veteran and you’re asked to fill out a burdensome application form that requires referencing 15 different resources — well, that’s a default too. And chances are that those requirements are actually nudging you away from accessing the benefits that you’re entitled to. So in other words, programs have a default design that’s going to influence people one way or the other. I think that with time, people are starting to realize that we can either use evidence to inform the design process in the way that we structure those defaults to get better program outcomes, or we can kind of leave them to chance or leave them to accident. I think that one mechanism that we’ve used to make sure that the public is fully apprised of our work and that we’re fully transparent, is to publish the results of everything that we do. So we publish the results of interventions that worked, we publish the results of interventions that don’t work, those that generated null results. We provide really detailed accounts of what every intervention looked like and what the analysis looked like and what the population looked like because this is a back-and-forth between our team and the public. And I think this transparency coupled with the fact that when people actually see what we’re doing in practice, they feel a lot of confidence that what we’re doing is benevolent and is serving program goals. I mean, you can think about theoretical risks, but when you actually see a team’s work documented in a report, it might assuage some of your concerns. One SBST intervention that hasn’t worked – yet – was a pilot program aimed at curbing the abuse of prescription opioid pain relievers. Drug overdose has become the leading cause of accidental death in the U.S.; in 2014, more than 47,000 people died. Roughly 40 percent of those deaths are said to be related to prescription pain relievers, although — and this may be material for a future episode of Freakonomics Radio — I’ve seen data suggesting that the lethality of legal prescription medicine is overstated, that it’s primarily heroin and illegal, synthetic fentanyl that are responsible. In any case, the Obama Administration had been working hard to bring down fatal drug overdoses. Maya Shankar and the SBST team took aim at doctors with the highest rates of opioid prescriptions. SHANKAR: So, they were I think in the top one percent of prescribers, and we simply sent them letters saying that they were in fact in the top one percent that the Department of Health and Human Services had taken note of this, and we tried to use social-norming effects, right? If they felt like they were truly outliers, then it might curb their prescribing habits. But we also wanted to give them concrete steps they could take if they in fact wanted to change their prescribing rates. So we gave them a set of good-prescribing practices to help nudge them in right direction. And we found that it didn’t work. And we have a lot of ideas about why it might not have worked. For example, the letters didn’t actually require that doctors sign off on it and send it back, and so you can imagine it getting to a doctor’s office and an administrative assistant opens the envelope, sees that nothing is actually required of them and then tosses it into the waste bin. SHANKAR: In the redesigned version, we emphasized the negative consequences of inappropriate prescriber behavior, we sent letters to prescribers multiple times. And we also included a signature line at the bottom of the letters that went out. We know in the area of flu vaccines that simply asking people to commit to a moment in time when they’re going to get their vaccinations and then signing the end of the form even though they never actually have to send that form back to anyone, it’s just for themselves, can actually boost vaccination rates. And so we use that same principle here. President Obama’s executive order has made SBST a permanent part of the federal government. SHANKAR: And I think that this has been our greatest institutional win . DUBNER: Okay, so when you had this idea and made it happen within the White House. Until then, you had been mostly a student for the previous bunch of years, so you weren’t some longtime practitioner of either behavioral sciences or a longtime practitioner of policy making, and yet you, fairly fresh out of the postdoc, are ultimately made head of this new White House unit, which on the one hand is awesome, and congratulations. On the other hand, I guess from the outside you could argue it’s a signal that maybe the White House wasn’t very serious about this or wasn’t really expecting all that much out of a unit like that. SHANKAR: Yeah, it’s a great question, I mean I think the President has created an environment that is inherently dynamic and entrepreneurial. And I think it allowed people like myself to come in with an idea and test out whether it could happen at all in government. And so I think that that’s led to a very interesting evolution. Which is because I came in without a mandate and without having the authority to simply create this team, what happened as a result is the evolution of the team ended up being far more organic. And I remember at the time thinking, “Man, this is kind of frustrating.” Right? I wish there was an easier way for us to get to yes, and that I could simply tell our agency projects, “Please take this risk. Run this early pilot with me.” But, you know what we’ve come to see is that in the longer term, this approach, this organic approach to actually having to convince our agency colleagues to run behavioral projects with us, doing the upfront work to convince them early on that there was inherent value in what we were proposing, organizing brown bags on behavioral insights 101, giving examples of success stories in which behavioral insights was applied to policy. Making sure that we aligned our recommendations with their existing priorities and goals. That all has helped in the longer term because I think it’s actually fostering true cultural change and buy-in in agencies. And for that reason, many of our early pilots with agencies have effortlessly led to longer-term collaborations at the request of our agency partners. So you can easily imagine that if I came in and I was able to order these pilots – well, as soon as I left those pilots, that work would probably leave with me. But because we were required to get their buy in, they started demanding this work. They started becoming internal champions for the work. And now we have a government that has a number of internal champions within the agencies that see the value and hopefully help the whole effort persist. SHANKAR: Which was signed into law by President Obama this past March and the bill establishes a 15-member commission to study how best to strengthen, expand the use of data, to evaluate the effectiveness of federal programs. So I think the fact that we have support on both sides of the aisle makes us very optimistic about the future of this team’s work. DUBNER: So, Maya, in addition to your SBST role, I understand you’ve been recruited by the United Nations to serve as the first behavioral-science adviser to the U.N. — with, I understand zero funding and zero staff. So what does that actually mean? SHANKAR: Well they must have thought, “Well, this girl seems like she’s a glutton for punishment. So we similarly don’t have a budget or mandate, so why don’t we bring her in to try to build a team here? HALPERN: Social trust is an extraordinarily interesting variable and it doesn’t get anywhere near the attention it deserves. But the basic idea is trying to understand what is the kind of fabric of society that makes economies and, indeed, just people get along in general. It’s an issue that’s got long roots, but it doesn’t mean that governments had done very much about it until very recently. Freakonomics Radio is produced by WNYC Studios and Dubner Productions. This episode was produced by Christopher Werth. Our staff also includes Jay Cowit, Merritt Jacob, Greg Rosalsky, Noah Kernis, Alison Hockenberry, Emma Morgenstern, Harry Huggins and Brian Gutierrez. You can subscribe to this podcast on iTunes or wherever else you get your podcasts. If you want more Freakonomics Radio, check out our archive, where we have every past episode. And you can also find us on Twitter and Facebook. « Previous PostHas the U.S. Presidency Become a Dictatorship? Next Post »Should We Really Behave Like Economists Say We Do?